My nephew is 3 and weighs around 30 pounds I am guessing. However, I would like to weigh him at home. 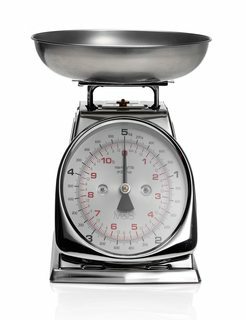 I have kitchen scales, one flat one that goes up 1kg and one that looks like this picture that goes up to 5kg. What is a safe and practical way I can weigh my nephew at home? I can think of two simple ways. The first would be to eschew the scale altogether and build a rudimentary scale with a stick and a pivot, and balance out your nephew's weight with a bunch of water in some buckets, or 2L bottles. Knowing the density of water, you could equate the weight of your nephew to a volume of water. If you are interested in correcting for the weight of the buckets, you could weigh those using your available scales. Or you could use a collection of solid objects and weigh these in turn on your existing scales. In the same spirit, with access to stick and pivot technology, along with a measuring stick, you could just make the lever arm on the side opposite your nephew a factor of 6 times longer (7 to be safe), and then find some objects around the house to balance out this rudimentary scale. That collection of objects (or water again) could be measured on your existing scales. Knowing this mass, and the ratio of the lever arms on the two sides of the scale, you'll get a weight for your nephew. The major source of error in both cases is likely to be the uncertainty in the location of the center of mass on both sides. I reckon you could get this down to about an inch or so without too much trouble, which would equate to an error in the mass of around 3% if your lever arm on each side was around 3 feet. Not perfect but decent. With less certainty in the position of the center of mass, or care taken, I would expect an error at the 10s of percent level. In the interest of science, I'll also report a method that I don't recommend. I was trying to think of an elastic medium that you would have access to in your home, which you could use to weigh your nephew incrementally. If you could imagine calibrating a single spring to a small mass, then you could use many such springs to measure your nephew. What spring-like material does everyone have access to many copies of? Socks! So, in the interest of science I took off my two socks and tried to see if socks have a hookian enough response to be useful. 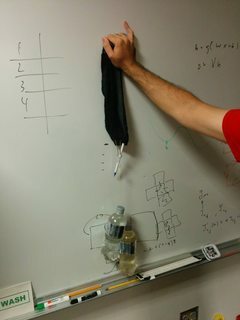 While this looks decent, I'm troubled by the fact that it doesn't line up well with the zero point extension of the sock, also we were only able to take 3 measurements since with the addition of the 4th bottle, the binder clip gave way. Regardless of the questions of hookian reliability of the socks, to weigh your nephew at around 30 lbs, you would need something like 25 nearly identical socks, or calibrate all of them individually, and figure out a way to reliably afix your nephew to the socks. Due to the impracticality of the method, I can't recommend this approach, though in the interest of science, and so that others need not follow in my footsteps, I've shared this failure here. Not the answer you're looking for? Browse other questions tagged mass weight or ask your own question. How can you weigh your own head in an accurate way? How do you weigh a box on a scale whose limit is too low? How much force is required to lift the back of a 2,480 lb car in the air from the bumper? What truly is mass, and is there a direct way to measure it? How can you accurately determine your own mass? Why does my apple not weigh 500 tons? How is a strength of a pull spread across two springs? 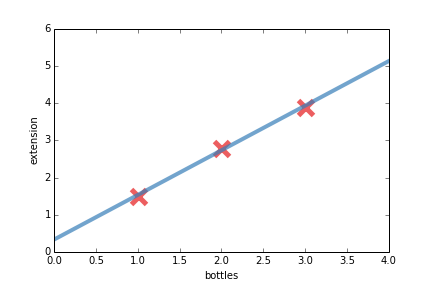 Why does the scale reading depend on the position of the object on the scale and how to equalize that?